Manchester United secured a 3-1 win over Middlesbrough at the Riverside Stadium on Sunday, with former player Victor Valdes guilty of handing them the third goal. 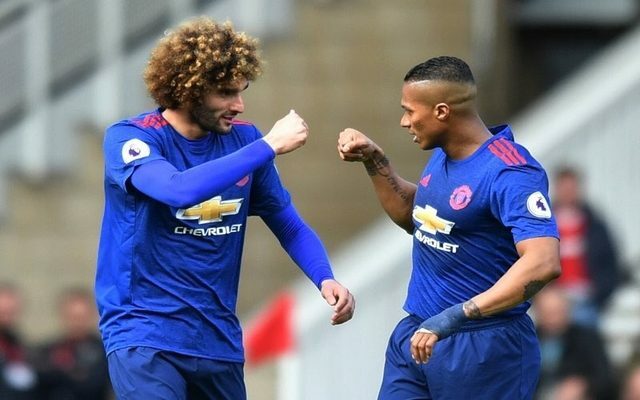 Goals from Marouane Fellaini and Jesse Lingard seemingly put the visitors on the path towards victory, but Rudy Gestede set up a nervous finish for them after capitalising on a Chris Smalling mistake. However, the United defender will be a relieved man as he wasn’t guilty of the worst error of the game as that came courtesy of Valdes who slipped at the worst of times to allow Antonio Valencia a simple tap in. Credit must go to the United man too for not giving up on the ball and continuing to chase it down in the final few minutes of the game and he got his reward for doing so as he put the game to bed with Boro threatening to take a share of the spoils. The Spanish shot-stopper will not want to see this again anytime soon, while in complete contrast United fans were loving ‘Agent Valdes’ contributing to their win as their former goalkeeper helped them avoid a frantic final minute or so with the hosts throwing everything at the United backline.